Doug MacLeod (5)Brilliant singer, songwriter, guitarist and raconteur from L.A.
Doug MacLeod was born in Virginia circa 1950 and raised in St Louis. He has overcome abuse and a crippling stutter to become a very highly regarded guitarist and singer songwriter on the L.A music scene. His love for blues was nurtured by a mis-spent youth prowling the bludgeoning St. Louis scene on the �funky� side of the city. Here he heard and befriended Albert King, Little Milton and Ike and Tina Turner amongst others. 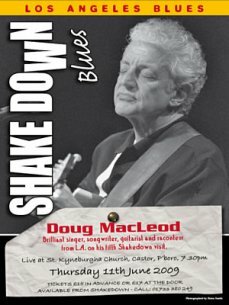 In the last couple of years Doug has seriously moved up in profile and has cracked both the Asian and Australian markets and is often appearing at festival circuits around the world. I speculated last year that we probably would soon no longer be able to afford him but thankfully we have been able to book him recently at short notice �one more time�.